S.W. 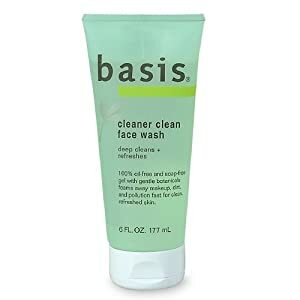 Basics Cleanser, Natural Rosewater and Tea Tree Oil Face Wash, 4 oz. S.W. Basics Cleanser is a natural face wash made with organic rosewater and organic tea tree oil. 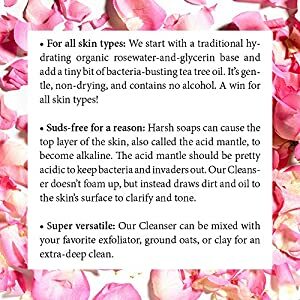 This rosewater cleanser not only smells great, but is perfect for all skin types, including sensitive skin. The tea tree oil also has cleansing and healing properties for problematic or acne-prone skin. 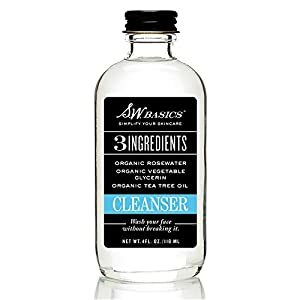 Use this daily vegan cleanser to feel hydrated and fresh. 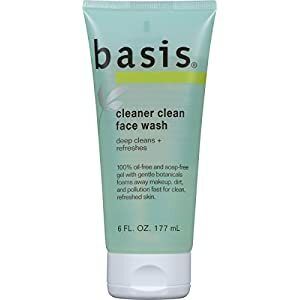 deep cleans + refreshes.100% oil-free and soap free gel with gentle botanicals foams away makeup, dirt and pollution fast from clean, refreshed skin.This clearly invigorating foaming face wash dissolves away dirt and makeup. 100% oil-free and soap-free. Gentle botanicals clean and clarify. 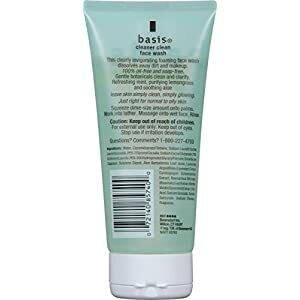 Refreshing mint, purifying lemongrass and soothing chamomile leave skin simply clean, simply glowing. Just right for normal to oily skin.WarningsFor external use only. Avoid contact with eyes. If contact occurs, immediately flush with water. Keep out of the reach of children.